WAKEFIELD captain Danny Kirmond has spent the last week in hospital with the knee infection that has sidelined him from tonight’s Ladbrokes Challenge Cup quarter-final. Second-row Kirmond, 30, was admitted last Friday before their game against Leeds Rhinos and placed on a drip as doctors battled to get the infection under control. He has since had an operation which it is hoped will aid his recovery but he won’t face former club Huddersfield. Trinity assistant coach Stuart Dickens said: “Kirmo’s still in hospital at the moment. 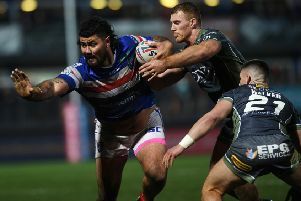 Losing their charismatic captain, who scored the only try of the game when Wakefield won 10-2 at Huddersfield in Super League less than a fortnight ago, is a major setback especially as Chris Chester’s side are also missing vice-captain Nick Scruton. Fellow prop Mickael Simon is unavailable due to a concussion suffered in the 32-6 loss to Leeds so Chris Annakin comes in. Dickens added: “Kirmo is a big loss as, obviously, he’s club captain, a big big leader who communicates with the players really well and I think over the last six or eight games he’s really set a platform leading from the front.